Over the years, the Furniture Department of The Conservation Center has helped conserve many works of furniture, both from museums and private clients. So this month, as the weather chills and we all get cozy in our big comfortable chairs, we wanted to highlight them, their work, and what we think are some of their most interesting and challenging treatments. Stephen Ryan studied furniture conservation at West Dean College in England. He has worked in the UK, Australia, and finally Chicago, where first he started his own business and then helped The Center create and build the Furniture Department we are so proud of today. After 30 years of experience in the field, Steve says his favorite pieces are in the antique George III and Queen Anne style. Rob Kleeman has worked in the conservation industry for over 40 years. He started working with wood and objects during his apprenticeship at a violin shop, then later transferred to a cabinet shop to work with furniture and at one point started his own business. Rob studied at both the Smithsonian Conservation Institute and The Campbell Center (now the International Preservation Studies Center). His favorite pieces to work on are in the English Regency style. Andrew Rigsby just recently finished his 4-year apprenticeship here at The Center! Before coming to The Center, Andrew finished his MFA in installation art at Southern Illinois University, and worked with a custom furniture manufacturer just a few years after graduation. He then worked with a company building custom photo booths and owned an art installation business. His favorite pieces to work on are from France and England dated to the 19th century. This intricately carved sideboard was created by Gerrard Robinson, a 19th century master carver who spent six years creating this masterful piece. It suffered severe damage from being submerged in the flood waters of Hurricane Katrina: the piece was covered in mold and grime and needed to be rescued and preserved right away due to the complexity of the damage. In order to treat the piece, it had to be completely taken apart. The treatment included intense cleaning and drying sessions, and arresting and removing mold, both of which needed to be carried out to each individual piece. After many hours of treatment, the work ultimately had to be pieced back together again like a puzzle. Despite the challenge brought upon our conservators by the intricate detail of the work, the Chevy Chase Sideboard looked better than ever before. The Farnsworth House before the flood. Following Hurricane Katrina, our home state of Illinois also suffered from flooding along the river. One house that was particularly affected was Mies van der Rohe’s Farnsworth House in Plano, Illinois. Inside, the house’s main wardrobe sat in a foot of water, leaving behind a distinct contrast in color. The furniture department started by removing the finish from the wardrobe. Then, the tide line was chemically treated until it was almost the same shade as the rest of the piece. This was a difficult process, as the veneer on the surface was very thin. Our team then introduced a bit of color through a slight tint in the polish. After working together on the piece, one wouldn’t be able to tell this wardrobe was damaged at all. One of the only surviving relics of President Lincoln’s early life, this couch is special not only to us here at The Center and the “Lincoln State” of Illinois, but the entire country. Despite its age, the couch was in pretty good shape when it arrived, but did exhibit age-related wear and tear. It had also undergone previous restorations, but coincidentally our conservators were able to find some of the original materials of the couch- such as the horsehair fabric- hidden in the back and arms of the piece. Our preservation of this piece also included stabilizing veneer, and the surface was in need of a thorough cleaning and polishing. Since the fabric of the couch was nailed down, the conservators were challenged with the task of working around it. In the end, they were thrilled with the opportunity to work on a piece of history special to our home state of Illinois. Our Furniture Department also treated this attractive walnut table decorated with intricate marquetry and boxwood inlay. Marquetry is a technique that requires years of training, perfection, and skill; it involves piecing together multiple hand-cut elements like a puzzle. Therefore, the conservation efforts required a vast amount of skill as well. The table had undergone poor restoration attempts in its past, in which a heavily pigmented polish was used to disguise repairs- but ended up covering the master craftsmanship in the process. The first order of business was to remove the polish. Once that was done it was easier for our conservators to identify the damages both structural and ornamental. Using fine craftsmanship themselves, our conservators recreated and replaced areas of inlay that were missing. 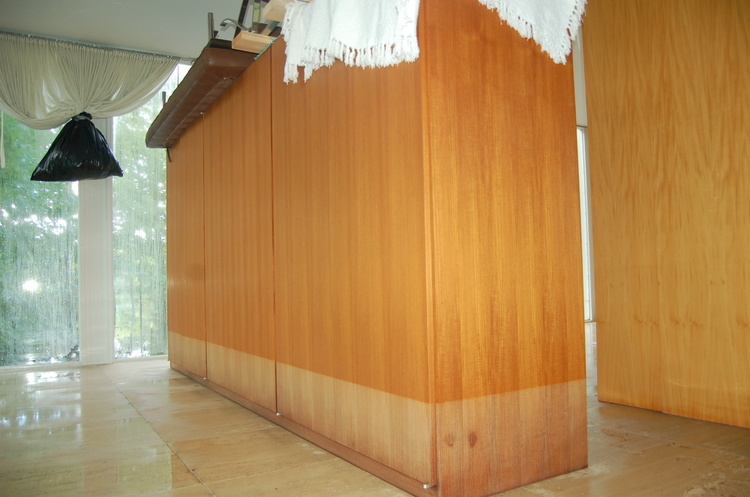 Veneer was repaired and secured down, and the whole surface was hand polished with shellac. Another challenging project was this Boulle Clock, fabricated by Rococo furniture maker Charles Cressent in the early 18th century. This clock was brought to us by the Halim Time and Glass Museum, located in Evanston, Illinois. It was composed of inlaid brass and tortoiseshell, both of which were lifting and exhibited areas of loss throughout. Our conservators seated the loose materials and cleaned the entire surface. They also replaced the missing pieces of inlay (using artificial tortoiseshell, as the use of real shell was banned in 1977), a process which required careful hand-cutting and intense precision. After over 100 hours of work, the clock looked incredible. 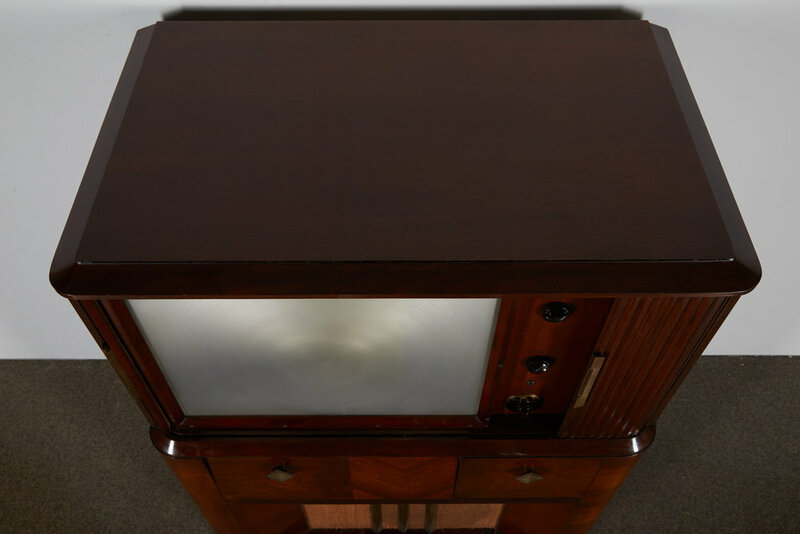 Last year, our Furniture Department got to work closely with the Children’s Museum of Indianapolis to repair a television cabinet that suffered severe water and mold damage. In addition to the water damage, the 20th century television also had areas of lost veneer and color loss throughout. Fortunately, our conservators were able to stabilize any flaking veneer and filled any area of loss, while also removing water damage. The piece was covered in a glossy layer of protective wax and can be appreciated back at its museum.